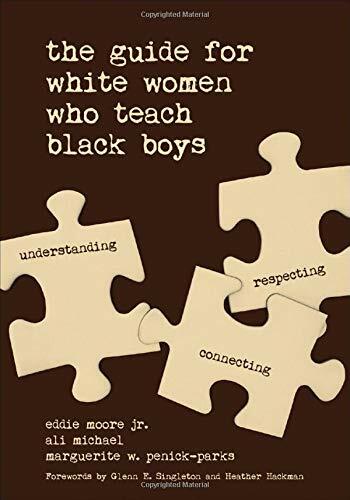 In The Guide for White Women Who Teach Black Boys there are 419 pages of material, 6 parts, 43 chapters with a section on references, over 60 contributors, an Index and a video resource guide you can access online: https://resources.corwin.com/wwbbguide. This book is brilliant. It is unapologetically honest. It is a manual for all teachers. It calls for an urgent response to the systemic destructive aspects of white privilege and its impact up the white female teacher and her black male students. It gives the reader sharp insights into the problems they have inherited thru a system which inadequately perpetuates a distorted view of black boys and in fact, white privileged women teachers when it comes to understanding cultural norms of their students. Increasing abilities to engage in cross-cultural relations (as we see so clearly in these times) can be a shame or guilt-driven fault-finding path that carries a great deal of anger and resentment with it or one which is swamped in denial of your privilege when white and a woman. Gender specific norms and nuances of the assumption of normalcy can plague the work you are doing. Those personal issues affect your classroom. Statistically-speaking the system has been failing black boys and their families’. For ex: You may be fearful of young black students, if so why? In a myriad of ways this book tells you why and what to do about it. Unlocking the unspoken or unexpanded narratives about the young boys in your care is so important. Just as gaining critical understandings of intra-racial engagement is so they ask you to: stay engaged, speak your truth, expect/accept non-closure and continuous learning: Why? Because teaching is an on-going process and cannot be reduced to a formula. They ask that you remember success at these junctures is authentic and productive in your interracial relationships due to their being 3 distinct stages: Engaging, Sustaining & Deepening relations. And go on even further asking you to discern your own individual & collective racial narratives = white and female : the racial texture of your own history & contemporary experiences & pay the closest attention to the way black boys & young men figure into such narratives – donning a protective armor of sorts – expect anger/rage to surface – a natural response to racial injustice. And do not minimize or quiet this pained voice for you can unlock the deep unspoken pain of racism now.